A good catering company can make all the difference. The following companies have become the most popular and praised in the state. You’ll get everything from award-winning service to mouthwatering dishes at these companies. Here are the 10 best in the state! The numbers don’t lie. M Culinary Concepts is the catering company to beat in Phoenix. It’s been the number one catering company in gross-sales in Phoenix since 2009, according to The Phoenix Business Journal. The company is the brainchild of esteemed chef Michael DeMaria and CEO Brandon Maxwell. The catering company is a local go to for everything from social gatherings to upscale events. Their fine-dining menus and wide range of buffet menus have helped keep this the number one catering option in Phoenix for eight years and counting. The Santa Barbara Catering Company is one of the best catering companies in Arizona and it has the awards to prove it. They’ve been the recipient the best caterer in Arizona by Ranking Arizona, the best wedding caterer by Arizona Foothills, and the international caterer of the year by the International Caterers Association. Santa Barbara has established such a good reputation by creating custom menus for all types of events. They specialize in everything from artisan plates to family style meals. They’re also environmentally friendly and use local products sourced from natural and organic farms. Fabulous Food Fine Catering has been a leading local caterer for over 20 years. The company is led by a husband and wife duo that creates the finest in catered artisan cuisine. Fabulous Food is a high-end catering company that works with corporate events, weddings, and corporate deliveries. They have also partnered with some of the biggest event venues in Phoenix, including the Phoenix Zoo, Desert Botanical Garden, and the Heard Museum. This catering company has renowned service and customizable menus perfect for big occasions. You can have all sorts of meals through Atlasta Catering. Atlasta is a long-standing family owned catering company. They have different menus for every meal of the day including breakfast, brunch, lunch, dinner and dessert. They’re known for a southern barbecue infused menu and for being a leader in sustainability. Most of their menus feature “farm-to-table” cuisine. Atlasta has won numerous accolades as one of Arizona’s best wedding catering companies. Arizona native Dawn Kennington-Bejar founded Benedicts Catering in 2003. It’s been a go to catering business for corporate and private events ever since. Benedicts is known for their service, presentation, and custom event planning for all occasions. Their entrees include inventive chicken, fish, and beef based dishes. In addition, their legendary hors d’oeuvres include crowd pleasers like tuna tartare, ceviche, and spring rolls. Sweets lovers rejoice at Robert’s Catering. This Chandler based catering company creates tasty wedding and custom event cakes for 35 years. Their large “CakeFolio” has an impressive selection of unique cake creations. Robert’s handles all sorts of events from weddings to corporate events to backyard barbecues. Robert’s is also known for being a one-stop shop. They have everything you need from champagne glasses to salt and peppershakers. Bruce Brown Catering has some pretty impressive clients. They are the preferred catering company of organizations like the Phoenix Art Museum, Arizona Capitol Museum, and National Bank of Arizona. 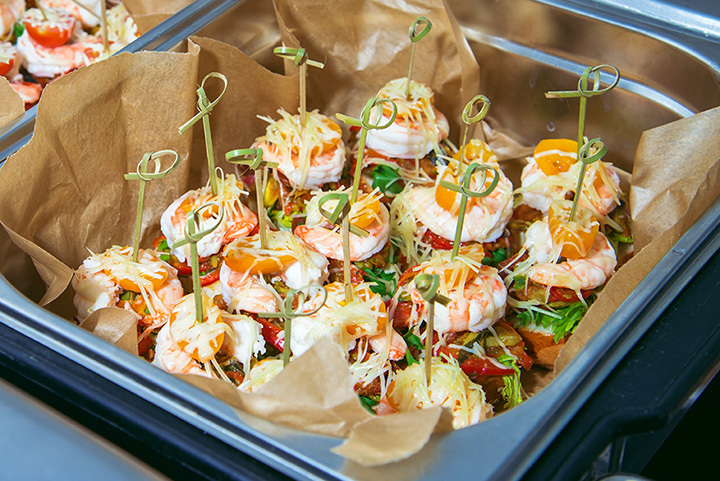 Bruce Brown provides catering services across Scottsdale, Phoenix and throughout the state. They’re known for providing services to small, private parties and to large weddings and corporate events. Their menu consistently impresses and has everything from filets to baby back pork ribs. Tucson foodies are a spoiled bunch. That’s because they have Chef Craig Nassar in their backyard. Chef Craig is a New York import that brought his expertise to Arizona in 2006. Since then, he’s been running The Practical Chef, a personal chef and catering company. Practical Chef provides catering for a range of events including company outings, weddings, and open houses. They don’t have pre-set menus, but rather make customizable dishes based on your preference and tastes. Pork on a Fork is more than a catering company. USA Today also recognizes it as one of the “Top 10 BBQ Joints in the Nation.” Pork on a Fork is known for smoking their meats for 15 hours to get perfectly tender meats. They have delicious dry rubs and signature barbecue sauces that keep customers coming back for more. You can get your barbecue fix offsite by hiring their catering service. They have a special menu with buffet style meals for corporate and social outings. Fat Freddy’s started as a small catering company in 1993. Back then; they catered almost exclusively to friends and families. Today, they’re one of the largest purveyors of catering to large corporations in the Valley. The full-service catering company is known for quality food and service. They cater to many private functions and are also renowned as a top wedding catering company. Fat Freddy’s menu is constantly changing, meaning no two meals with Fat Freddy are the same.